Average Height	: 21" - 24"
Average Weight	: 45 - 65 lbs. Northern Illinois Vizsla Rescue, Inc.
Vizslas are depicted on etchings that date back to the 10th century. They originate from Hungary bred by the Magyars, who used them as hunting dogs. They are thought to have descended from several types of pointers along with the Transylvanian Hound and the Turkish yellow dog (now extinct). "Vizsla" means "pointer" in Hungarian. The dogs worked as hunters, their superb noses and endless energy guided them to excel at catching upland game such as waterfowl and rabbit. The breed almost became extinct after World War II. After the war, when the Russians took control of Hungary, it was feared that the breed would disappear from existence. In an attempt to save the breed, native Hungarians smuggled some of the dogs to America and Austria. The Vizsla has two cousins, one with hard-wirehair called the Wire haired Vizsla and the other a rare Long haired Vizsla. The longhaired can be born in both smooth and wirehair litters, although this is quite a rare occurrence. The longhaired Vizslas are not registered anywhere in the world, but some can be found in Europe. 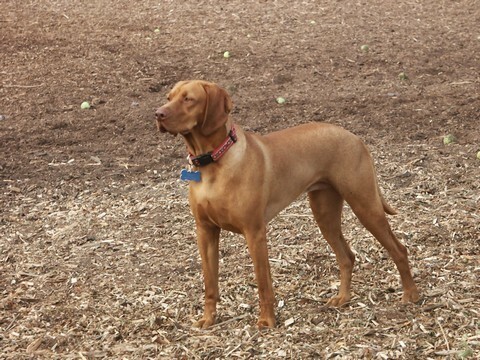 Some of the Vizsla's talents include retriever, pointer, game bird hunter, obedience competitions, agility and watchdog. The Vizsla is known for being affectionate, gentle and vulnerable. The dog is also protective of its owner and adopted family. The breed is fearless and intelligent. A loyal animal, Vizslas attach and bond quickly to their owner, forming close, tight-knit ties. A Vizsla will follow you from room to room, as you wander throughout your house. Their sometimes, clinging ways leads to their nickname of "Velcro" dog. The Vizsla is not known for being a barker or a noisy dog. It is quiet, barking only if goaded or the circumstances warrant it. This does not make them passive. Vizslas can be both aggressive and destructive. Highly intelligent dogs with a need to be active, they become bored and restless if not stimulated or exercised. If left cooped up too long, a Vizsla is a destructive animal; if bored, a Vizsla will resort to eating anything and everything, stealing food from off tables or countertops. Vizslas, well bred though they may be, are not adverse to overturning and gobbling the contents of garbage cans. You can sometimes find a mildly bored Vizsla lying on tables or other places it should not climb. Overall, the Vizsla is a gentle, quiet, good-natured dog and highly intelligent. It is confident and likes to be with people, even children. This breed however, needs sufficient training to keep both you and it happy and content. Both the wire haired and short haired Vizslas do not require extensive grooming. You can, however, do a few things to ensure your dog's coat remains clean and shining. First, bathe the dog regularly. Vizslas love to swim in the water. Their choice of aquatic medium, however, may leave a lot to be desired. A bath will remove the swampy smell and allow you to see whether there are any nicks or scratches requiring medical attention. Next, brush the coat at least once a week. This will reduce shedding to a minimum. Vizslas are not heavy shedders, but brushing keeps the amount of dead hair ad dander to a minimum. It allows you to admire your dog and to check the coat for possible problems e.g. allergies, bites. Finally, polish the coat with a soft cloth once a month to increases the sheen. You can purchase special cloths, dog-specific shampoo and various dog products to help you do the best job possible. Contrary wise, you can use a damp sock to attract the dead hair. To ensure your dog's overall condition is healthy, examine the ears and nails regularly. If your Vizsla runs through the woods, check the ears and body carefully for ticks and bites from insects. Clean the ears gently using baby oil and cotton. Avoid penetrating too far into the ear canal. Only clean the area around the ear. You should also make sure water does not become trapped causing infection. Examine the ears and eyes, particularly if you suspect the water to be polluted. Remove any grime in a bath. If you have any doubt, call a veterinarian. Grooming your dog should be fun for both you and him or her. If you make it a chore, neither of you will want to take part. Grooming plays an important part in maintaining your dog's health. It gives you a chance to catch problems before they become major medical situations. The fondness of Vizslas for water and their propensity for allergic reactions make good grooming practices a necessity. When you think, "Vizsla," think lots of exercise. An exhausted puppy cannot stir itself to get into trouble. From puppyhood onwards, the Vizsla is a dog that requires exercise and more exercise. This does not mean you have to take the dog hunting or retrieving. What a Vizsla needs is a healthy active lifestyle. Vizslas require their owners to take them for extended walks, long runs, jogging, hiking, biking or roller blading. Find an off-leash park where the dog can play with others. Throw things for a Vizsla to retrieve, particularly into the water. Take training lessons. Above all, keep the exercise at a high level at least twice a day. This will produce a calm, contented dog less likely to act out frustration with destructive behavior. It will also, prevent the dog turning your home into its own personal racetrack. It is important to exercise the Viszla mentally as well as physically. These dogs do best when given a challenge through going new places and experiencing new environments. Not only will this help with the physical management of the dog but it will also help with socialization as well as allowing the dog to become more comfortable in a variety of settings and in new activities. Vizsla owners are happy when their Vizsla is well trained. This does not simply apply to teaching your dog to be a pointer and a retriever. Vizslas, like all dogs, need to be taught the basics-socialization with humans and other animals, toilet-training, not to jump and other obedience and behavioral survival skills. Fortunately, Vizslas are intelligent. They respond quickly to a consistent and even-handed effort. Vizslas like to please. Although they mature slowly, they learn quickly if you do not bore them. When you decide to toilet train your puppy, remember, either you have to be with him or her to prevent a mess, or you will have to crate. Simplify things by establishing regular feeding and walking routines. Let the puppy out to the same spot to relieve. Take the puppy out when you see it circling or around half-an-hour after eating or immediately after the puppy gulps down a lot of water. The sooner you undertake socialization training with your dog, the better the chances you can avoid anti-social behavior. Start by introducing the puppy to humans and other animals, including dogs and cats. This will prevent aggression and shyness with strangers. Make sure you use a motivational or reward-based training method. This works best with Vizslas. Reinforce positive behavior. Vizslas are intelligent dogs who like to please. Vizslas are also retrievers. This means they constantly put any and everything in their mouths. Provide them with an astounding array of toys to chew on. Allow them to carry their favorite toys everywhere. The basic nature of a Vizsla assures an owner that training can result in a high level of obedience. Vizsla's do well in a number of classes, competitions and trials including obedience, field and conformation.